Every single frame of the teaser trailer for Star Wars: The Force Awakens has been examined all over the internet, and it's led to rampant speculation about a variety of things. However, one element that seems to have been largely overlooked isn't something that can be seen, but rather heard. At the very end of the teaser trailer, after the "December 2015" bumper disappears, there's the sound of a lightsaber. For some reason, "Good Morning America" went out of their way to reveal the "exclusive" detail that the sound was that of Luke Skywalker's lightsaber from A New Hope and The Empire Strikes Back. Who cares, right? Well, what's interesting is that the sound in question isn't used as a cool way to reveal the release date, but it comes after that title card. You might just disregard that as a fun little easter egg, but this is Bad Robot and J.J. Abrams we're talking about, so it has to mean something. Thankfully a hint at the answer just might lie earlier in the trailer, and it seems to be confirmed by plot details that leaked over the summer. Now keep in mind that this is just speculation, so don't take any of this as fact or even rumor when it comes to the events that will unfold in Star Wars: Episode VII. First of all, let's talk about the plot details that surfaced over the summer. We won't get into specifics (you can read more details right here), but the most important detail is that our main characters come into possession of Luke Skywalker's lightsaber at some point in the film. Rumors peg the lightsaber as a MacGuffin that leads them to encounter Han Solo and Chewbacca, who haven't seen Skywalker in 30 years, and this leads them to go searching for the Jedi. Though we've also heard that our heroes may not be the only ones looking for their estranged friend, and they may also be after the lightsaber too. If Luke Skywalker's lightsaber is an important plot device, that would certainly explain why Abrams chose to include the specific sound of his lightsaber, which actually belonged to his father Anakin Skywalker (Darth Vader). And if it's the lightsaber Luke was given by Obi-Wan Kenobi, that would explain why it's been lost all these years, since it fell somewhere in Cloud City along with Luke's hand in The Empire Strikes Back. Though that also makes us wonder if Luke still has the green lightsaber that he had in Return of the Jedi. But more importantly, we also wonder why Luke's lightsaber is important at all. Perhaps the answer lies in the reveal of what has been dubbed the crossguard lightsaber (which got a variety of reactions online). As you can see in the trailer, this is not your father's lightsaber (or Luke's father's for that matter). But beyond the addition of a lightsaber hilt, there's another difference: the sound. Listen to that new lightsaber when it ignites. That's not the smooth, humming sound we're used to hearing when the weapon is turned on. It crackles, and almost sounds weak. Even the blade doesn't look solid, almost like fire instead of light. Some fans have been speculating as to what the practical use of the cross guard saber could be. One theory is that it could prevent hands from getting chopped off, but since the cross guard blades aren't flush with the handle, the large blade would likely just cut through the hilt. 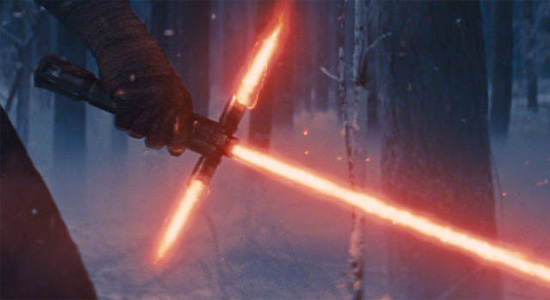 But the theory I like is one that fits with the seemingly crude nature of this new lightsaber. The explanation of the cross guard lightsaber that seems to make the most sense is that the two side blades are merely exhaust vents to keep the weapon from overheating. But that's never been a problem before, so why now? Well, the film is called The Force Awakens, and the voice over (confirmed to be Andy Serkis) says, "There has been an awakening. Have you felt it? The dark side…and the light." It seems that in the 30 years since Return of the Jedi, the Force has laid dormant, and maybe the way of the Jedi and the Sith have become myth. And so, perhaps this new lightsaber is a poorly constructed version of what the weapon should be and Luke's is the last real remnant of the elegant weapon. That would explain why these new villains, whoever they are, want Luke Skywalker. Perhaps they not only want to flush out any return of the light side of the Force, but they also need crucial information as to how to build a proper lightsaber. In the expanded universe (which isn't canon in the Star Wars universe anymore), the Sith figure out how to create synthetic lightsaber crystals, a key element in building the weapon. Maybe that's why this crossguard lightsaber looks and sounds so different from the ones we're used to seeing. Anyway, this is obviously super nerdy, and we probably won't have any idea if this is a reasonable train of thought until sometime in the middle of next year. But it's fun to think about. Thoughts? Fascinating theory Ethan, I really love it. Does no one else think Serkis might look like a younger Palpatine.....if they go down the clone route.. I could see it, but doubtful. I think he does. His mouth has a similar shape too. Curious how, with the level of technology, they forgot how to make lightsabers. Each jedi makes his own, with no jedi left, the art is lost. Its not the technology thats lost, its how the pieces go together. Thanks, because I needed yet another reason to watch that trailer. Again. And again. You're right. I'm gonna go watch the trailer again. Do you know how I know you've watched the trailer too many times? The crackling of a lightsaber is now creating theories. Not sure how I would react if the capabilities or effectiveness of lightsabers in this movie were a central driving force for the plot. Seems like something too small to hang a conflict on. "Though that also makes us wonder if Luke still has the green lightsaber that he had in Return of the Jedi." I remember Luke throwing aside his green saber in Return of the Jedi in his refusal to kill his father. It does not fall into the pit because he was facing away from it; I just hear it clattering away. Just checked the footage from the end of Jedi; Luke has the saber clipped back on his belt as he walks into the Ewok celebration. Well when all it takes to find it is to toss out your hand and will it into your hand, its hard to imagine ever losing it. I just can't wait. Goddamn it. I did notice that sound effect at the end, and thought it was an odd place to use it. Now you've got me thinking and theorising too! I think you're on the money about an Awakening of ancient Sith, though. My personal theory at the moment is that the "Empire" (or what's left of them) will end up joining forces with the "Rebels" (or whatever they call themselves now) to battle a new army of dark warriors. Makes sense, With no order or empire there is no one to guide new force users in the way of saber craft. Finding possibly the last saber would be a huge boon to which ever side got it first. It plays into something Lucas said in regards to the fancy fights in EP1-3 vs EP4-6. In Eps1-3 the art of saber fighting is at its height, as such you have the ballet like fights. The ensuing years of jedi eradication leave the art lost in time until Obi Wan passes what he knows to Luke. we got a year to go. you may want to space out the Puffery. Exhaust vents? And the exhaust looks the same as the blade? It's just a silly design, that's all. I'm sure lightsabers are rare though. I think there was a lot of rambling in this post and none of it mattered... holy crap people grasping at straws to keep their SW coverage going when it doesn't need to. I haven't felt the Force yet. Does this mean that I am a droid?